Ukraine’s President Petro Poroshenko dissolved the country’s parliament on Monday, August 25, and announced early parliamentary elections to be held on October 26, 2014. His move can be interpreted as a response to the widespread opinion in Ukraine that, after the Euromaidan, the annexation of Crimea and the armed conflict in the country’s two eastern regions, Ukraine’s parliament did not properly represent the political preferences of voters, Arsenyi Svynarenko writes. It was expected that the members of the coalition government would want to see new parliamentary elections to take place as soon as possible, perhaps before the end of military action in the Donetsk and Lugansk regions. At this point, their opponents are at their weakest, and the liberated towns and villages are controlled by the newly appointed administration loyal to Kiev. It already seems quite obvious that this year’s events will have a profound long-term effect on Ukraine’s internal political processes. The country’s political landscape is shifting, new political actors are emerging, and old ones disappearing. The war, which has resulted in the deaths of hundreds of servicemen and civilians, is seen by many as a consequence of the former President Viktor Yanukovych’s corrupt rule. Compared to the Orange Revolution, the current crisis is deeper and it will leave a deeper scar in the memories of Ukrainians. Thousands of young people have also become active citizens by participating in volunteer work, donating to the army or by joining army and police volunteer battalions. They and their family members have voted for competing political parties and leaders. Young adults have witnessed the rise and fall of larger parties such as Our Ukraine, the Socialist Party, the Party of Regions, and the Communist Party. Political parties in Ukraine change very fast. They change names, rewrite their programs, and new parties emerge. However, the political culture changes at a much slower pace. Ukrainian political elites are rigid and defensive against any significant change and new political parties. At the same time, Ukraine has well established networks of youth organizations and NGOs. In the long-term, the most important impact of the Euromaidan and the armed conflict in Ukraine may be that they have raised political mobilization to new levels and highlighted that there is a functioning civil society in the country. An important aspect of the crisis in the east of Ukraine is that many voters are left without political representation. In the 2012 parliamentary elections, the majority of southern and eastern Ukrainian voters supported the Party of Regions and Viktor Yanukovych. In the Donetsk and Lugansk regions, Yanukovych’s party won in all the constituencies with results varying from 42 to 90 percent. In fact, the Party of Regions has held the majority of seats in virtually all regional and municipal councils in the southern and eastern regions of Ukraine after the 2010–2012 regional elections. Viktor Yanukovych and his party promised to bring economic growth, build better relations with Russia, and establish Russian as the country’s official second language. In February 2014, Yanukovych, the formal leader of the Party of Regions Mykola Azarov, and a few other key figures from Yanukovych’s government and party fled Ukraine. Since March 2014, opinion polls have been showing a significant drop in support for the Party of Regions in all regions and particularly in the eastern parts of Ukraine. Neither the rebel leadership nor any of the Ukrainian political parties or leaders can rely on the support of any significant part of voters. The first signs of a new kind of political mobilization were already visible in the country’s presidential elections and the local elections in Kiev. For the first time since 1991, a candidate won in the first round of the presidential elections. This was also the first time that a candidate won in all the regions. The opinion polls demonstrated that Poroshenko, who received 54,7 percent of the total vote, was the leading candidate also in the eastern regions of Ukraine. However, there the support did not exceed ten percent as the majority of voters did not endorse any candidate, not even those representing the Party of Regions or those considered pro-Russian. Considering regional disparities in political voice, it is also important to note that a substantial amount of pro-Russian voters in eastern Ukraine and Crimea did not vote. In eastern Ukraine some 30 percent of the voters said that they would not vote while in western Ukraine only three percent did not plan to vote. Significant changes also occurred in the local elections in Kiev on May 25, 2014. The political party of Vitali Klitschko, UDAR, received a majority with 77 from 120 seats, compared to the 15 seats it won in the previous elections in 2008. The second largest group in the Kiev municipal council is now the Radical party lead by Oleh Lyashko with seven seats. One of the seats was taken by Ihor Mosiychuk, who was at that time a representative of a far-right organization called the National Socialist Assembly. It will be interesting to see how these signs of growing political mobilisation will play out in the October parliamentary elections. The opinion polls conducted by the Kiev International Institute of Sociology in July suggest that the impact of the crisis has, indeed, been profound. Three key trends are worth pointing out. First, the extreme populist Oleh Lyashko and his Radical Party were leading in electoral ratings as 20 percent of those who planned to vote said that they would support the party. Second, the Solidarity Party of President Poroshenko is second in the race for parliamentary seats, even though this party does not really exist. However, the real perspectives of the radical populism of Oleh Lyashko and the “virtual” Solidarity Party associated with the president remain unclear at this point. Third, the Communist Party and the Party of Regions can barely make it to the new parliament if they survive and will not be banned. Both the Party of Regions and the Communist Party have been accused of supporting unrest in eastern Ukraine and are associated with corruption in the government and law enforcement agencies. They have already lost much of their support in all the regions. There is also a possibility that the traditional voters of the Party of Regions and the Communist Party – which were previously supported by one third of all voters – will not have anyone to represent their interests. The upcoming parliamentary elections may become a good opportunity for newer parties to enter national level politics and to strengthen their influence. The polls indicate a growing support for parties which have been less known to voters.The leaders and activists of these parties – Democratic Alliance and Self-Help –gained popularity during the Euromaidan. On the other hand, the growing popularity of Solidarity, the Radical Party, and UDAR is mostly due to the voters’ trust toward their leaders as well as to the expectations that in the future their parties will have a positive influence on the country’s development. How then, are Ukrainians going to vote in the upcoming parliamentary elections? And what political choices can we expect the new parliament to make? According to the polls, the parties that can be expected to win most seats in the upcoming elections are Solidarity, Fatherland, and the Radical Party. The Solidarity Party associated with Poroshenko is now supported by 12 percent of voters. It has more support in central and southern regions (14%) and less support in western regions (11%) and eastern Ukraine (8%). But if one takes into account only those respondents who intend to vote in the elections, the support of Solidarity increases up to 20 percent. In fact, President Poroshenko has no political party and in this sense, as earlier pointed out, Solidarity is a “virtual” party. Nevertheless, every fifth voter in Ukraine is ready to support Poroshenko by voicing support to Solidarity. It is also noteworthy that after winning the presidency Poroshenko had to build his own team, and his first appointments to the administration demonstrated that he was mainly relying on his business experiences together with political alliances with other parties. This would now be an opportunity for Poroshenko to get his own people into the parliament and to form a “presidential party” together with UDAR and other allies. It is most likely that in the new parliament, Poroshenko’s Solidarity would lead the presidential block of parties comprising UDAR and Third Republic of Yuriy Lutsenko as well as a few smaller parties. The opinion polls of July 2014 demonstrated that such a block of parties could receive a 30 percent support in the elections from those who intended to vote. On August 27 the Solidarity party congress decided to rename the party as a “Petro Poroshenko Party Block”, and Yuri Lutsenko was elected as the new leader. The party will seek to build a coalition with other parties prior to the parliamentary elections. How about Yulia Tymoshenko? Her party, Fatherland, is a pro-EU centrist party with a vague political ideology. After the collapse of the Party of Regions, Fatherland had the biggest group of deputies in Ukraine’s parliament. There is a high probability that Yulia Tymoshenko will try to reclaim her popularity, but the prospects seem dim. The election campaign will most likely be marked by conflicts between Tymoshenko and her former allies as well as by aggressive populist rhetoric about fighting corruption and lustrations in the government. Moreover, Fatherland was a leading party in the Yatsenyuk government, and it is therefore associated with unpopular reforms. After being released from jail, Tymoshenko was not able to maintain her new image as a victim of political repressions. It is likely that her previous experience in the government is perceived negatively. There is also competition for a new leadership within the party. It now seems that UDAR, Fatherland, and Poroshenko’s “virtual” Solidarity all have chances to become confident winners in the parliamentary elections and to form the new pro-European coalition government. There are also some smaller or entirely new political parties that have emerged to Ukraine’s political landscape as a direct outcome of the Euromaidan and the military conflict. It will be interesting to see what kind of political positions they take and how they succeed in the elections. 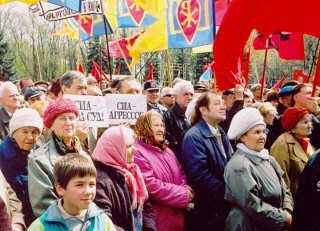 Among these parties are the Self-Help Party (Samopomisch), Civil Position (Hromadyans’ka pozitsia), Democratic Alliance, and Liberty (Volya). It is possible that radical or radicalising far-right movements will get more places in the new parliament through Oleh Lyashko and his Radical Party. In the 2012 parliamentary election Lyashko was the only representative of his party to be elected as a deputy to the Verkhovna Rada, Ukraine’s parliament. Now he has gained more public support by capitalising on the crisis in eastern Ukraine. The ideology of Lyahsko’s party can be described as extreme populism with no distinctive political identity along the axis between left and right. Lyashko is building an image of being a fighter for Ukraine. For example, he travels to Eastern Ukraine on missions of ”finding traitors” with his armed team and TV journalists. Yet, the radicalism of Lyashko’s Radical Party can also be seen as a façade for some more complex political processes. In the new Kiev municipal council, none of the seven deputies from the Radical Party was elected from single-mandate constituencies. In effect, the party can only rely on the party image and may only win seats in the new parliament as a result of votes for party lists. Ironically, the Communist Party was in a similar situation in 2012 when it won seats in the parliament and lost in all the 225 single-mandate constituencies. People voted for the party’s image, not for its individual members. It is also possible that some far-right organizations win several seats in the parliament from the Radical Party lists. This may apply, for instance, to Andriy Biletsky and his neo-fascist Social-National Assembly, although there were recent reports about conflicts between Lyashko and his party. Another right-wing party, the conservative and nationalist Svoboda, is represented in many municipal and regional councils in central and western Ukraine. In the previous parliamentary elections it won 35 seats, which came as a surprise to many. Some experts suggested that the media support from the allies of the former president Victor Yanukovych was crucial for Svoboda’s strong performance in the 2012 elections: Svoboda provided a convenient opponent to the Party of Regions in its attempts to build a negative image of Ukrainian nationalism and to mobilize pro-Russian voters around the Party of Regions. In the polls, Svoboda’s support is now around six percent. After the Euromaidan, Svoboda has lost its main message. Aggressive rhetoric against Russia and Vladimir Putin is no longer the exclusive right of this party as similar rhetoric is used by Lyashko’s Radical Party, Right Sector, and even members of some bigger parties. Svoboda’s simultaneous EU skepticism and its pro-NATO views are shared by a small fraction of nationalistically minded voters. Oleh Tyahnybok, the leader of Svoboda, has on several occasions indicated that his alliance with such pro-European parties as Fatherland and UDAR is temporary. The actual support for Right Sector, a far-right political party led by Dmytro Yarosh, is very limited, at best around one percent. Right Sector appeared in November 2013 during the Euromaidan where it was established by members of the protestors’ self-defense units sharing nationalist ideas. Among these were members from such nationalist organizations as Tryzub, the Social-National Assembly, Patriot of Ukraine, and the UNA-UNSO, as well as radically minded youth and football fans. If in 2012 after Svoboda’s strong performance in regional and national elections it was possible to speak about growing radicalization in Ukrainian politics, this is no longer the case. Svoboda’s success was short-lived and the armed conflict brought popularity to the radical populists in Lyashko’s party. At the same time, the radical and genuine nationalists in Right Sector or Svoboda seem to be losing support. – Key positions in new local governments in eastern Ukraine are likely to be given to people loyal to the main political parties in the government. – Some 25–30 percent of voters in the eastern regions, which previously supported Party of Regions and a pro-Russian course, will boycott the parliamentary elections or will not be able to vote because of the armed conflict. – Extreme populists from Oleh Lyashko’s party and the Solidarity Party, which does not de jure exist at the moment, may receive significant number of seats in the new parliament. – There is a threat that far-right politicians will be represented in the new parliament. – Nonetheless, the Eurosceptic Svoboda, the Communist Party, and the Party of Regions will have significantly weaker positions in Ukraine’s parliament. – The Eurosceptics and the right-wing parties (Svoboda, Radical Party, Right Sector) will hardly be able to compose a party block for the 2014 elections. – The future parliament will have a pro-European majority composed of UDAR-Solidarity, Fatherland, and Civil Position. The Eurosceptic and populist opposition may include Svoboda, Radical Party and Strong Ukraine. – There is a possibility that the deteriorating situation in eastern Ukraine that coincided with the official start of the election campaign may lead to a declaration of martial law and to postponing the parliamentary elections.